What is liver cirrhosis and how to treat it? Cirrhosis is a chronic, progressive disease characterized by degeneration of liver cells, the creation of fibrous tissue and circulatory disorders in the liver, which disrupts the function of vital organs. Although this is a very serious disease, beverages based on medicinal plants with a combination of proper nutrition can alleviate the development of this disease and encourage regeneration of the liver. How is it formed, which are the main causes and symptoms of the sick liver, and how to treat this disease, read below in our article. 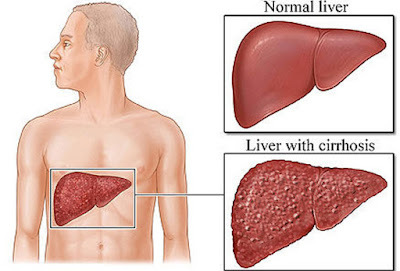 There are a number of different causes of cirrhosis, and one of the more common is the excessive use of alcohol, which causes their toxic action of fatty infiltration of the liver, and irreversible damage to the hepatocytes, this is called alcoholic liver cirrhosis. Today's statistics show that even 10 to 35 per cent of consumers of alcoholic beverages are developing the so-called alcoholic hepatitis, which is the first step to cirrhosis. How alcoholics have a poor lifestyle, do not consume sufficient amounts of minerals and vitamins, the whole process significantly speeds up the walls of the liver to act up. Hepathologists and experts in this field believe that alcoholics need to be vaccinated against the hepatitis B in higher doses than is commonly practiced, in order to prevent complications of what is cirrhosis of the liver. Acute or chronic viral inflammation of the liver, especially if accompanied by jaundice, can lead to post hepatitis cirrhosis. Inflammation of the gallbladder, as well as other conditions that involve a lengthy stoppage of bile, leading to biliary cirrhosis of liver. This difficult disease may cause some chronic diseases (diabetes, obesity in the stomach), fatty food with enough protein and B vitamins, as well as autoimmune diseases. This disease is accompanied by malaise, fatigue, emaciation, chronic fatigue, sudden weight loss, frequent fever and jaundice, which is caused by the accumulation of bilirubin in the blood. On the face, chest and hands appear red dotted spots from which capillaries branch out and in the palms there is a strong redness, these are also the first symptoms of cirrhosis of the liver, while in the advanced stages the disease leads to the accumulation and retention of fluid in the abdomen. Symptoms in men may be testicular atrophy, decreased hair growth on the skin and gynecomastia (painful breast augmentation), and if there is brain damage, mental changes occur in the form of depression, anxiety disorder, confusion, reduced powers of judgment, essential tremor of hand. It was already then that cirrhosis is in last stage of the disease, which unfortunately has a very bad and unfavourable prognosis. Although this is a very serious disease, lifestyle changes can slow down its flow. First of all, a complete abstinence from alcohol is recommended, regular physical activity, staying in the open air, recreation, and of great importance proper and balanced healthy diet is required. Persons who have been diagnosed with cirrhosis can consume the following foods: stale, toasted bread, low-fat cakes, milk, sour milk, yoghurt, kefir, low-fat hard cheeses, veal, lamb and poultry, lean pork meat (the best and safest is cooked ), chicken breast and turkey breast, boiled or roasted lean marine and freshwater fish, soft boiled and fried eggs, fresh fruits and vegetables, mashed potatoes, fresh squeezed juices from natural fruits and vegetables, compotes, jams, butter, as well as healthy unrefined oil. This should also be properly balanced with diet for cirrhosis of the liver, but is also recommended for other diseases of the body with small corrections, but you can rewrite the menu with an expert –nutritionist and the other hand, the following foods must be avoided in a wide berth: fresh, rye and corn bread, full-fat and aged cheeses, fatty beef and pork, smoked meat and many processed meats (salami, sausages, pates), fried and canned oily fish (sardines, etc. ), hard-boiled eggs, mayonnaise, pickled cabbage, kale, cucumber, raw peppers, mushrooms, fried potatoes, margarine, strong tea, and carbonated and cold drinks. The disease as liver cirrhosis strictly prohibits the consumption of carbonated and especially alcoholic beverages! Wash and dry the young leaves of horseradish, then chop them and pour them into a glass jar. Fill almost until the top, but do not compress but let it be loose. Then pour a homemade plum brandy or brandy, sealed and allowed to stand for a week in the fridge. Strain and drink the soup spoon of horseradish tincture dissolved in 1 decilitre of warm water, 3 times a day half an hour before all the main meals. Wash a kilogram of peeled onion with two cups of sugar, and then keep everything in preheated oven until it gets light brown colour. Take one tablespoon of the resulting syrup three times a day before meals, for a period of one month. Mix 60 g of mint, 50 g of horsetail, 40 g of yarrow, 30 g of lemon balm, 20 g of oak bark, 20 g of plantain and 10 g of wormwood, and 4 tablespoons of the mixture cover with a litre of cold water and leave it covered to stand throughout the night. In the morning warm up to boiling and leave it covered to rest for ten minutes, then drain well. Drink during the day in small sips. Mix 10 g of centaury, 15 g of lemon balm, 20 g of blueberries, 20 g of thyme, and spoon a mixture and pour with 2 dl of boiling water and leave it covered to rest for half an hour. Strain and drink 1-2 cups of tea a day. Grind two full, well-washed lemons and mix it with a kilogram of local honey and 2 dl quality olive oil. Take one tablespoon of balm 3 times a day half an hour before meals. Pour a tablespoon of a dandelion root with 2 dl of boiling water and leave it covered to rest for half an hour. Strain and drink the tea of ​​dandelion in sips during the day. Pour a teaspoon of ground pine with 2 dl of boiling water and leave it covered to stand for thirty minutes. Drain well and drink during the day. Pour a teaspoon of nettle with 2 dl of boiling water and leave it covered to rest for at least half an hour. Strain, add the lemon juice, and drink 2-3 cups of freshly prepared tea per day. Mix equal amounts of St. John's wort, calendula and chicory, 2 tablespoons of the mixture pour with 5 dl of cold water and leave it covered to stand overnight. In the morning heat to boiling, then strain and drink throughout the day in small sips. Therapy lasts for 2 months, and then next month drink the tea: mix equal amounts of horsetail, yarrow and bar, and a spoon of the mixture pour with 2 dl of boiling water and leave it covered to stand for 2-3 hours. Strain and divide into three parts, and drink three times a day, thirty minutes before each meal. In its early stages, an energetic, timely and somewhat more aggressive therapy, cirrhosis of the liver can be successfully treated, provided that it is has not already caused some complications in the body. The only terms is a strict adherence to therapy and most importantly whether intake of alcohol and other toxins and poisons (cigarettes, industrial food, soft drinks) has been stopped. This is especially important for the further course of the disease and treatment. Healthy, correct and balanced diet with supplements of necessary minerals and vitamins, as well as preparations of the herbs are also very important for further recovery. With serious complications of advanced cirrhosis, today liver transplant is done. If the person who has alcoholic liver cirrhosis, continues with the consumption of alcoholic beverages, it will lead to life-threatening and difficult to survive situations and will not live more than five years. Mortality in severe liver damage is very high. The decision to stop drinking in less advanced stage sometimes means slowing down the disease and further progress of the same, so quitting alcohol is a top priority. 85 percent of people who are cured of alcoholism, survive longer than 5 years. Timely diagnosis, abstinence from drinks, dietetic nutrition program, treatment with medications and preparations of medicinal herbs slows the progression and relieves pain caused by cirrhosis of the liver.